Following the UFC 183 Doping scandal critical questions were asked of the Nevada State Athletic Commission. 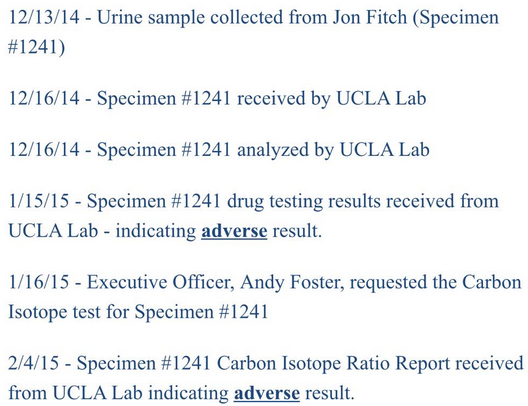 In short, they chose not to ask for the pre-bout drug samples of Anderson Silva to be subject to expedited testing. This resulted in the sample results not being revealed until after the bout. Anderson Silva reportedly was using anabolic steroids and had the results been expedited the bout could have been called off. This delay jeopardized the fundamental issue of fighter safety. Today it was revealed that Jon Fitch failed a drug test requested by the California State Athletic Commission which was taken prior to his WSOF 16 loss. The results were not available until after the event. Like the Silva affair, if the results were known ahead of the bout the event would have been cancelled. As the fundamental role of Athletic Commissions is to look after combatant safety, Commissions would wise to ensure that pre bout tests can be taken with sufficient time to receive the results prior to a bout so events involving an athlete using illicit PED’s can be called off before clean competitors are exposed to unnecessary and preventable harm.